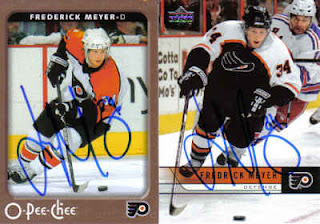 In the grand scheme of things, getting a couple cards signed by New York Islanders' defensemen Freddy Meyer isn't a really big deal. What is kinda cool, though, is the fact that we have both lived in Rochester, N.H. Though he signed cards from his time with the Philadelphia Flyers, he said he's happy with the move to Long Island. "I'm getting a lot more playing time," Freddy said. Addendum: Take a closer look at the cards. The O-Pee-Chee card spells his first name as Frederick. The Upper Deck card spells it Fredrick. His profile at NHL.com offers his full name - Frederick Meyer IV.